Oscar Pistorius: Olympian, Gentleman, Hero. Oscar Pistorius of South Africa will leave the London Olympics without a medal, having run in the 100-meter sprint and as the team’s anchor the 4 x 400-meter relay. He finished fourth in the sprint, and his team finished last in the relay. 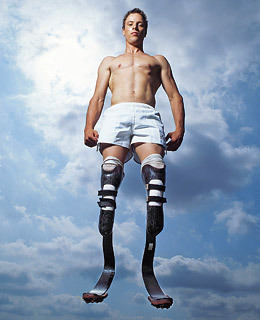 But two things should be pointed out: Oscar Pistorius had both legs amputated when he was 11 months old and runs on carbon blade prosthetics; and he ran his 400-meters in 45.69 seconds – the second-fastest time of all four of his team members in the relay, and his three teammates were never better than last place through the entire race. Through his indomitable will and hero’s spirit, Oscar Pistorius embodies not only the very best of the Olympic spirit, but the absolute best of humanity; a pinnacle of heart and courage to which the rest of us can only aspire. What was Pistorius’ comment when his 2012 Olympics experience was finished? “It’s inspired me and motivated me for the next four years looking to Rio,” he said. Oscar Pistorius doesn’t seem to know how far beyond a gold medal he already is. Excellent read, I just passed this onto a colleague who was doing a little research on that. And he actually bought me lunch because I found it for him.